Human resource department is one of the most complex and demanding operation within any organization. The SureCommand Human Resource (HR) system is designed to help your operation with understanding its human resource needs. The SureCommand HR system can process many HR transactions including the administration of Government forms, coordinating talent needs, and calculating performance. The SureCommand HR system displays employee demographics information, operational statistics such as recruitment and attrition rates and also predict future hiring needs. The SureCommand HR system manages applicant information, assignments, employees access, employees private information, organization policies and procedures, compliance, progressive disciplinary actions, terminations. Make sure your personnel is ready for their assignment and that they have met all the organizational requirements before being deployed by using the SureCommand Deployment System. 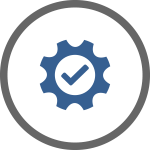 The deployment process is designed to ensure that the new members of your organization meet your organization's requirement and are certified to deliver service to your customers. The SureCommand Deployment feature ensures that the Guard has a proper uniform, has read and signed all company policies and procedures and has delivered all the proper documents before being eligible to receive a scheduled shift. The SureCommand recruiting system is designed specifically for the private security industry and has the largest list of licensed Security Guards and Private Investigators in the world. The SureCommand recruiting function provides an organized list of human capital that can be refined through an assortment of relevant filters. 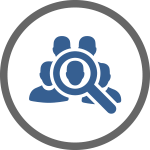 The recruiting feature enables users to filter candidates by experience, city, and schedule. The recruiting feature enables you also to manage your interest in the candidate, perform interviews and to upload resume information. This feature gives your business the refined process it needs to find the right people. The SureCommand recruiting function displays lists for recent graduates, advanced database searches, and offers a job posting and job fairs feature. The Employees List function gives human resource managers an overview of the organization's total population size, number of skills, and the number of active and inactive employees. The SureCommand Employee List function also shows the types of departments, how many individuals assigned to the departments and the number of roles within those departments. The Employees List function also displays the statistics on the organization's recruitment rates, attrition rates, and seasonal comparisons to forecast human resource requirements and demographic information. The goal of SureCommand Performance Management System (PRMS) is to help guide employees to achieve their performance goals. 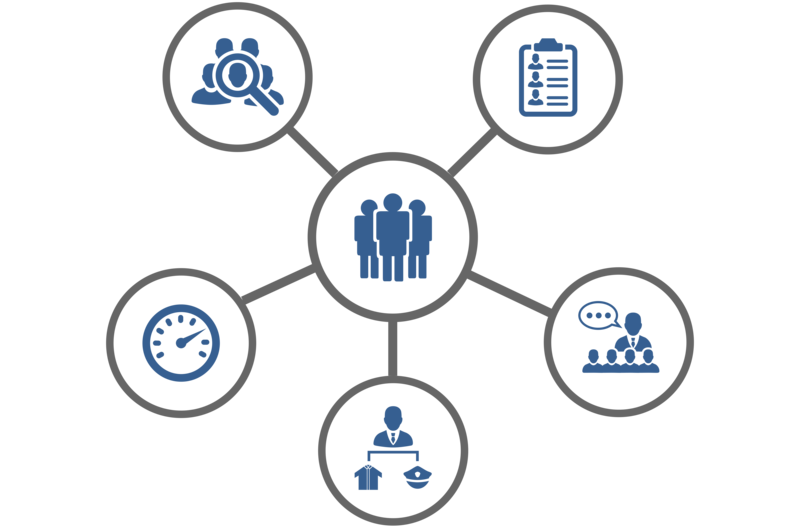 The SureCommand PRMS system provides a continuous process where managers and employees work together to plan, monitor and review an employee's work objectives or goals and his or her overall contribution to the organization. The SureCommand PRMS measures performance with metrics - analytics - statistics on important information. Some of the performance measurements include; shift attendance reliability, punctuality, and the number of patrols, occurrence reports, and incidents reports. Do you know the number of uniforms your organization needs to purchase? Do you know what size each employee wears? Do you know who has handcuffs, batons or a vest? The SureCommand Uniform Management System shows you in a single dashboard how many items you have and need and when you need it. Guards and Investigators can select their profiles and enter their clothing size so administrators can have a better understanding of what to order and how much to deduct from the employee's payroll. The SureCommand Training Management System (TMS) provides employers with the ability to administer training online or in class. The SureCommand TMS system offers many settings that will enable your organization to set training completion requirements before the commence working with your organization or at a specific site before being able to receive a schedule. The TMS system offers a visual transcript dashboard and a printable certification PDF. Employers can upload training material, enter any questions for testing, regulate the minimum amount of time they must spend on the course, and provides a certificate upon successful completion to employees. 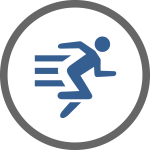 Training settings enable administrators to upload an unlimited amount of training courses, create requirements under training settings, and assign prerequisites in a progressive training program. The Compliance Management System (CMS) helps your employees maintain their compliance with company policy and legal requirements. 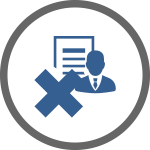 The CMS system displays a dashboard of compliance-related information that gives users notice when licensing or training is about to expire, the process on re-validating, and the ability for the user to upload their validation documents. The CMS displays the compliance validation documents in a sequence priority list that have been uploaded by users to verify by the Human Resource administration department. It will also show a list of the earliest training dates that are available to the employee who requires re-certification. The SureCommand Human Resource Mobile Application function displays a list of employees who are operating the SureCommand mobile application. This system is designed to give the Human Resource department the ability to manage the employee's technical compliance and ensure that they have the latest mobile application version. 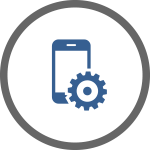 This system helps to avoid any technical obstacles the employee may experience while operating their SureCommand mobile application. 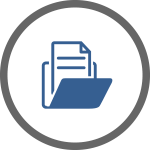 The SureCommand Document Manager organizes documents that employees require access to for administrative processing purposes. 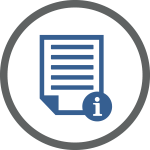 These administration processing documents can be downloaded, updated or modified by any employee or have access restricted to certain employees. The administrative documents can be government documents, like tax forms or internal documents like vacation request forms. When the employee uploads the documents, it will be put into sequence priority for administrative processing purpose. The Termination Management system is designed to provide a process for the end of employment recordkeeping requirements. This system helps guide users through a thorough and simple wizard to determine whether an employee is being terminated voluntarily or involuntarily, is eligibility for re-hire, provide exit interview templates, indicate severance pay requirements, uniform collections, and to process Government forms for record of employment. Policymaking, communicating new policies and managing compliance can be a complicated matter. Properly managing your organization's policies and procedures can reduce conflicts, prevent misunderstandings and costly mistakes. The SureCommand Policies and Procedure Management (PPM) system enable the Human Resource to manage the policies and procedures documents electronically. The SureCommand PPM allows users to upload policies for every individual department and manage who has read the policies with a digital signature acknowledgment. The PPM notifies users of new policy directives, displays a list of outstanding signatures required and mandate policy before deployment.